Curtin Springs Paper allows us to show you the intricacies of our home. The minute detail of our landscape and just how diverse and amazing it really is. 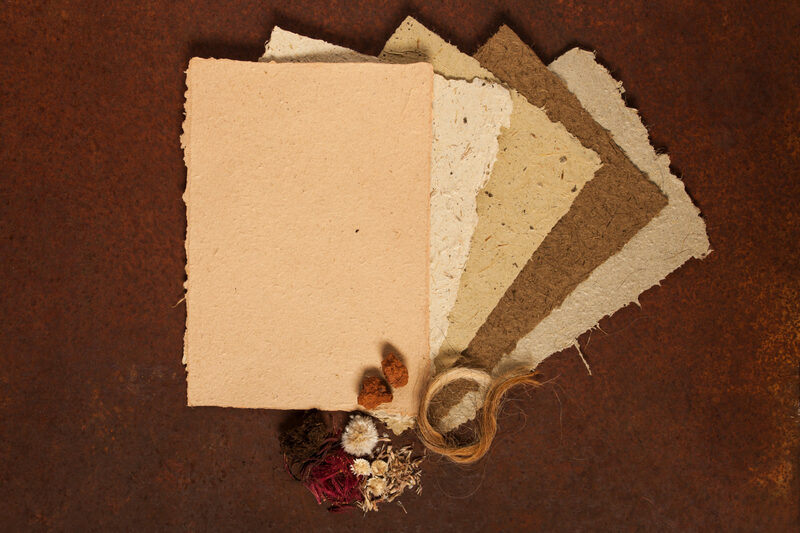 Curtin Springs Paper invites the desert to offer up its hardy ingredients to combine and make something beautiful. Nature is literally transformed in this remote and special part of Central Australia. 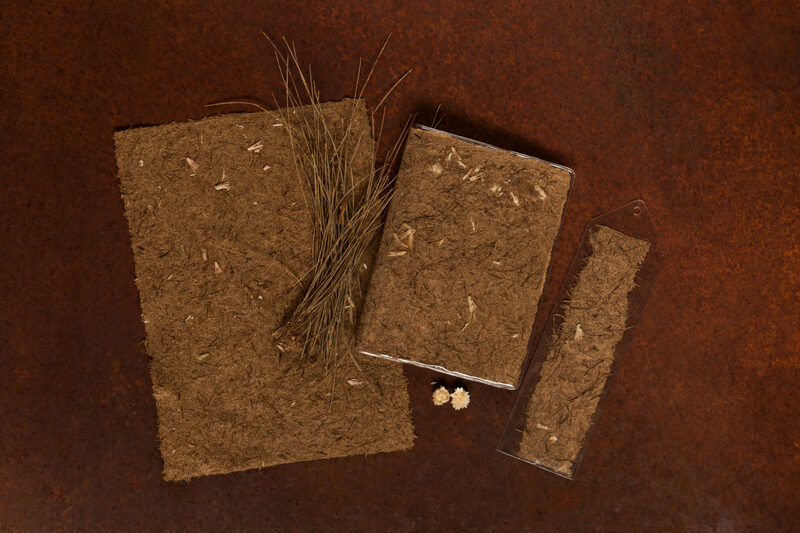 Here native grasses are harvested, pulped and pressed to create a distinctive and beautiful souvenir of Central Australia. We harvest our native grasses by hand; using a pair of secateurs, a hessian sack and our knowledge of the Curtin Springs landscape. Each type of grass creates a different texture and feel in the paper, whether it be spinifex, oat grass, woollybutt, kangaroo or kerosene grass. The different seasons also produce differences in the papers. Therefore, each and every production run makes a quality paper that is unique and individually made. In addition, we continue to experiment with blending and texture, using plants, flowers, clay, sand and cow poo as well as other things like the bangtails from the cattle. The paper is suitable for an endless array of uses and we are investigating lots of them. How you can you enjoy Curtin Springs Paper? You can join one of our 1 hr Curtin Springs Paper Tours to share the wonders of our home and get to know our history, landscape and connection to the land. You can join our tours at 10.30am and 4pm daily. Our regular Curtin Springs Paper Workshops give you the opportunity to be involved in the paper making at every stage, help us cut some grass, turn it into paper and then use the paper to produce YOUR interpretation of our amazing landscape. Book with some friends and make an adventure out of the trip or join a open group and meet others who will enjoy the opportunity with you. Here is the workshop information, dates and prices. We have just launched our Artist in Residence program. We have a range of amazing artists now joining us during 2018/2019. A schedule of these visits will be made public shortly. For your information, this is a brochure about Curtin Springs Paper. The one thing we are always certain of here, is that there is always the chance to continue with change. The art sector was always going to be interested in Curtin Springs Paper. But we weren’t sure what that involvement would look like. Amee Porter (one of our next generation), came into the office one day. She said ‘Mum, I think we can use our paper to make beads and the beads to make jewellery. I think this would really add to the story we are telling”. So that’s exactly what we have been doing. Amee has a very artistic streak and is allowing her creativity to develop. Curtin Springs Paper – Jewellery is handmade, completely individual pieces of jewellery that are using Curtin Springs Paper as the focus. Have a look at what Amee is doing. Not content with just one direction into the creative world, Amee has just held here second exhibition of artwork from Curtin Springs Paper. We have opened The Gallery, which is our chance to showcase Amee’s work and for visitors to experience the beauty of Curtin Springs Paper in a range of different mediums. Spending time in The Gallery is part of the 1 hr Curtin Springs Paper tour. 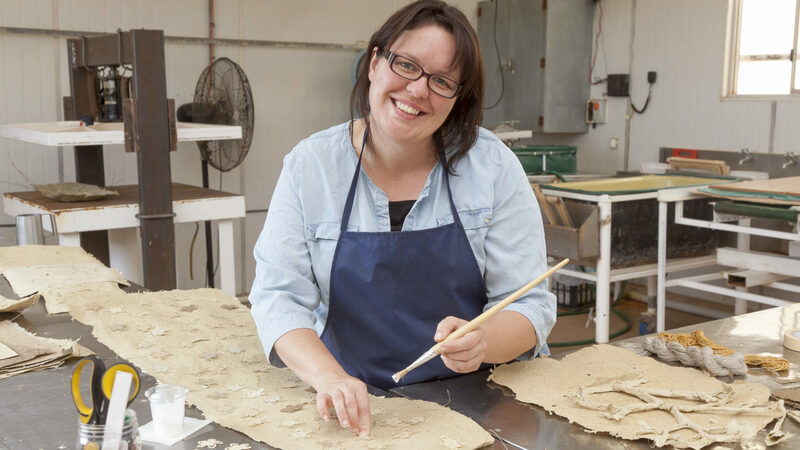 We invite artists to apply for Curtin Springs Paper – Artist in Residence Program. There are 4 residencies on offer each year starting in 2018. Applications for the 2018 residencies are currently open and close on the 15th October 2017. For all the details including application process, dates and what it entails please see our Curtin Springs Paper – Artist in Residence Program Information Pack. Where we make our paper might surprise and fascinate you. There is no big factory here, but instead a building where we pay homage and respect to our pastoral and family history – the Old Abattoir. Built in the late 1970’s and decommissioned in the mid 1980’s. You will be fascinated (as we have been) that the building and its features appear as though it has been built to purpose with it’s sloped floor and separate cold room it is perfect for paper making. We repurposed and recycled almost everything in the building from somewhere else on our million-acre station. This reveals the innovation and inventiveness that only remote living can bring! We milled timber from desert oak trees to use in displays. It was important to us to find a home for these trees after they had been killed by bushfires. The timber fence posts are the original mulga fencing posts from the 1950’s. Peter hand-cut and hand-drilled these posts. They were part of the boundary fence until they were ‘retired’ to be used here. The vat is an old bath. The men manufactured the 15 tonne paper press from the framework of an old truck, old car springs, and a jack found ‘down behind the shed’.